In the presence of Prime Minister of India, Shri Narendra Modi and Prime Minister of Japan, Shri Shinzo Abe, Ceremony for commencement of Work for First High Speed Train Project (popularly referred as Bullet Train) between Mumbai Ahmedabad to take place on 14th September 2017. 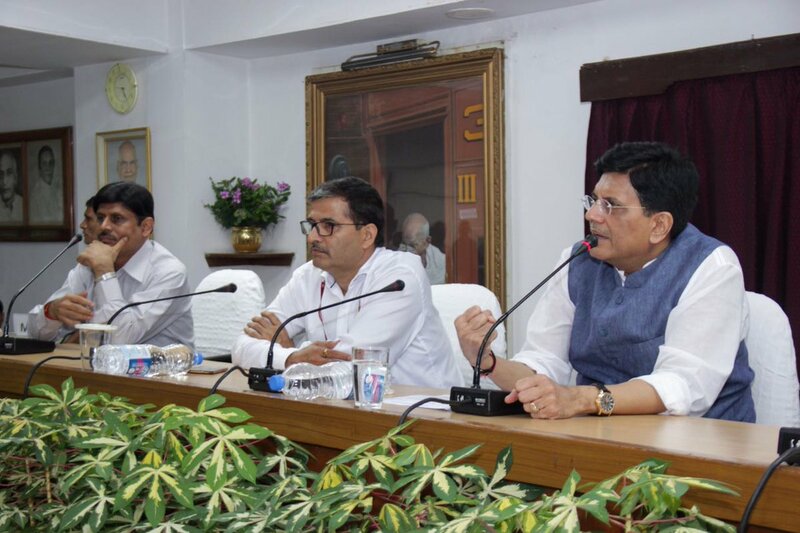 Minister of Railways Shri Piyush Goyal briefed media about Mumbai- Ahmedabad High Speed Train Project (popularly referred to as Bullet Train project) in Rail Bhavan on Monday. Minister of State for Railways & Minister of Communication (I/c), Shri Manoj Sinha was also present to brief the media. Chairman, Railway Board, Shri Ashwani Lohani and other board members were also present on the occasion. This Mumbai – Ahmedabad High Speed Rail (MAHSR) project (popularly known as the Ahmedabad-Mumbai bullet train)is a visionary project which will herald a new era of safety, speed and service for the people and help Indian Railways become an international leader in scale, speed and skill. Generally, any such loan even from World Bank or such other agencies costs about 5-7% with a repayment period of 25-35 years, thus India is getting loan for the High-Speed Rail Project at almost zero cost without putting any strain on existing financial resources available with the country, as more than 80% of the project cost is being funded by Government of Japan. Clearly Peter is not paying for Paul. It is for the first time in the history of the country that an infrastructure project is being funded on such favourable terms. One of the prime objectives of the project is “Make in India”, which is to be realized before commissioning of the project. As per the agreement between Governments, the MAHSR Project has “Make in India” & “Transfer of technology” objectives.Under the guidance of task force (DIPP and Japan External Trade Organisation (JETRO)), action is being taken as per accepted concept paper guidelines. Active interactions are already taking place between the industries of India and Japan. It is expected that many joint ventures will be formed in the time to come to take up manufacturing of various components including rolling stock. This will not only benefit the Indian Industry with new technology but will also create several job opportunities within the country. The Make in India objective will also ensure that most of the amount invested in this project would be spent and utilized within India. The construction sector in India will also get a big boost not only in terms of investment but also with respect to new technology and work culture. This project is likely to generate employment for about 20,000 workers during the construction phase, who will be trained specially to take up construction of such projects in India. Some of the new areas where construction skills would be developed are ballast-less track, under sea tunnel etc. In addition, 300 young officials of Indian Railways are being trained in Japan to give them exposure in high Speed Track Technology. Keeping in view the long-term plan for human resource development, Government of Japan has also offered 20 seats per year for Master’s course from the universities of Japan, for serving Indian Railway officials. This programme is fully funded by Government of Japan. Unlike other areas,for high speed, country is getting a cutting-edge technology in totality. The Shinkansen Technology is known for its reliability and safety and is proven for more than 50 years. The train delay record of Shinkansen is less than a minute with zero fatality. Thus,the project is set to provide reliable and comfortable service with high standards of safety. The technology regarding disaster predictions and preventions will also be acquired as a part of the project. Such safety systems ensure that the train operation safety is maintained in case of any natural calamity such as earthquake etc. With the presence and availability of this technology, India will be leapfrog to the cutting edge of latest train developments with passengers able to reach their destination in 2 hours as against the current 7-8 hours by train. Keeping this scale-up in mind, there are other high speed corridors which are being reviewed – Delhi Kolkata, Delhi Mumbai, Mumbai Chennai, Delhi-Chandigarh, Mumbai-Nagpur, Delhi- Nagpur. All these corridors will also be able to operate high speed trains in the future. For this, the Ministry of Railways has constituted the National High Speed Rail Corporation Limited, which is also implementing this MAHSR project. Recommendation of Empowered Committee for Innovative Collaborations (Chaired by Vice Chairman,NITI Aayog) and sanction by Cabinet in December, 2015. Length 508 KMs (approx. ), doubleline through two states, Maharashtra(156 KMs)and Gujarat(351 KMs) and UT of Dadra and Nagar Haveli (2 KMs). Longest tunnel 21 KM switch 7 KMs undersea (Thane Creek). 12 stations: Mumbai, Thane, Virar, Boisar, Vapi, Bilimora, Surat, Bharuch, Vadodara,Anand, Ahmedabad,Sabarmati. Underground station Mumbai, all others elevated. Maximum Operating speed of 320 kmph. Cost estimated at Rs.1,08,000 crore-entire corridor elevated for safety and land economy. 81% of the project cost by Japanese soft loan at 0.1%per annum with repayment period 50 years–including grace period of 15 years. Project funded by a loan on terms which tantamount to a grant. As per the agreement between Governments,the MAHAR Project has “Make in India” & “Transfer of technology” objectives. Four Sub-groups with representatives from Indian industry, Japanese Industry, DIPP, NHSRCL, JETRO to identify potential items /subsystems / activities for make in India. Will launch Indian Railways to be select club of countries having the state of the art technology. National High Speed Rail Corporation Limited, incorporated with equity by Ministry of Railways, Governments of Gujarat and Maharashtra in February 2016. General Consultant (GC) & Environment Consultant appointed. Schedule of Dimensions (SOD) and Manual of Standards and Specifications for track,tunnels,bridges,Signalling, Telecom and OCC finalised. Ground Survey completed using Aerial LiDAR Technique. Social Impact Assessment (SIA) consultant for Gujarat and Maharashtra appointed. Land acquisition- ROW requirement is under finalisation. 1 Comment on "Minister of Railways, Shri Piyush Goyal briefs about the High Speed Train Project Between Mumbai & Ahmedabad – Read More"
Quality of electrification in high speed rail should have to be international.